On a hot, sunny Sunday in mid-August, John Wilkinson sat around the dining table with his wife, Alice, and their daughter Sadie, going on 5 and about to start kindergarten. She was coloring and giving her Dad gentle orders about the proper color units for her regiment of markers. Outside it was still and muggy. Across a quiet Sunny Valley Road an occasional breeze ruffled the pretty farm fields of The Nature Conservancy’s Sunny Valley Preserve. The remains of John and Alice Wilkinson’s New Milford house after the Aug. 29, 2012, explosion. Credit: Litchfield County Times. Five years ago on the evening of Aug. 29, 2012, the place where the Wilkinsons were sitting was a pile of twisted rubble, and for days afterward the field nearest the house was a staging area for TV news reporters and cameramen. Periodically they would go live with updates on the house that had exploded, leaving only the chimney standing. A propane gas leak in the basement resulting from plumbing work caused the explosion. The plumber, Anthony James Fratino III, 47, of New Milford, was killed in the blast, and his son Nicholas was in the yard at the time of the explosion and was seriously injured. Alice Wilkinson, eight months pregnant with Sadie at the time, wasn’t home. The Wilkinsons’ boys, Jake and Everett, had gone to a neighbor’s house. John Wilkinson was home—and he was buried in the debris. “Five years in, we’re looking to the next thing—and not letting that day define us. We’re strong enough to get through it,” John says, reflecting on the explosion and his long recovery. What’s important for the Wilkinsons are the family members, friends, neighbors and larger communities that came together to help them rebuild not only their house but also their lives and sense of well-being. Throughout their ordeal they have singled out Cramer & Anderson Partner D. Randall DiBella and his team for praise, crediting the attorneys for guiding them through a complicated, emotionally wrenching situation to an optimal outcome. Alice, Sadie and John Wilkinson on the front porch of their new house five years after the explosion. “It was a long, tough litigation, and early on Randy warned us this was going to be very technical,” says John, who recently sent Attorney DiBella another email expressing deep appreciation as the five-year anniversary of the explosion approached. “He took good care of us. I trust them 100 percent,” adds Alice, who contacted Cramer & Anderson Partner Dan Casagrande the day after the explosion on the advice of her brother-in-law. “I met with the attorneys right away because I didn’t know what was heading my way,” Alice recalled. “We immediately hired fire scene experts and explosive scene experts,” Attorney DiBella has explained, and they were on the scene the same day with Attorney Casagrande. The Wilkinsons had hired their friend Tony Fratino of Fratino Plumbing to install a new gas powered hot water heater in the basement. On Aug. 29, 2012, after smelling gas in the house, John Wilkinson called Tony Fratino back to address the situation. Although the insurance company for Fratino Plumbing alleged at one point that John Wilkinson was the responsible party for leading Tony Fratino into a basement filled with gas, it turned out that an error by the contractors led to the explosion, which was ruled accidental. The scene the night of the fatal house explosion in New Milford. Photo by Laurie Gaboardi. Attorney DiBella and his team, including Attorneys Casagrande, Kent Mancini and Abigail Miranda, secured a significant settlement for the Wilkinsons, and the family’s home was replaced separately by their homeowners insurance. “This house is very much modeled on the old house that was here,” though slightly larger, John Wilkinson says. Apart from the well, the only things that could be salvaged were some large stones that form entrance steps. Most of what visitors see in the house was given to the family. “The community was very generous,” John says, noting that the family moved into the new house Aug. 23, 2013, six days shy of a year after the explosion. 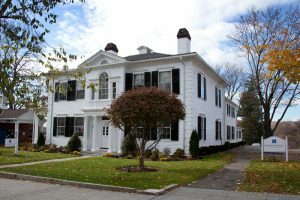 The family had been staying with John’s father, Loy Wilkinson, at his home in Bridgewater, and Alice’s father, Addison Havens, and brother Daniel Havens built the house with design help from retired Sherman architect Charlie Reppenhagen. The house, or lack of a house, was at the front of John Wilkinson’s mind after he miraculously survived the explosion and was sent to The Connecticut Burn Center at Bridgeport Hospital from Danbury Hospital. “Alice was eight months pregnant. She didn’t have a house. She didn’t know what she had for a husband,” he says in thinking back on his mindset. Alice went initially to live with her family in Sherman, and “family descended on us” to help in every way, John recalls. From Bridgeport Hospital he went to the Bethel Health Care Center for rehab, before being released to his father’s house in November 2012 and going back to work as an engineer for 3M around Christmas. “It’s kind of been a steady march to get back to normal from there,” John says. Along the way he was in a wheelchair and using a walker, he has lots of scars, and is deaf in his left ear. And that steady march was interrupted last May when the family participated in a Warrior Dash event. John took a hopeful leap in attempting to navigate one of the obstacles (“because he thinks he’s unbreakable [after a house fell on him],” Alice jokes), and landed awkwardly enough to break his leg. These days for the Wilkinsons, that just falls into Alice’s category of the small stuff you don’t sweat. Instead the family prefers to look to the future, and the five-year anniversary of the explosion feels to the Wilkinsons like a natural turning point. Jake is entering New Milford High School, Everett is moving to Schaghticoke Middle School and Sadie is going to kindergarten—and funds from the settlement are invested to pay for the children’s college tuition. Among the highest rated lawyers in Litchfield County, Cramer & Anderson Partner Randy DiBella has received a rating of AV Preeminent® in the Martindale-Hubbell® Peer Review Rating™, which reflects that fellow attorneys consider him at the highest level of professional excellence. Attorney DiBella, whose Practice Areas include Personal Injury, Civil Litigation, Land Use & Environmental Law and Municipal Law, works primarily in Cramer & Anderson’s flagship office in New Milford and lives in Litchfield.